The trek from Patnitop to Sudh Mahadev is firmly etched in my memory for all these reasons. This moderately difficult trek connects Patnitop with a historical temple at Sudh Mahadev. 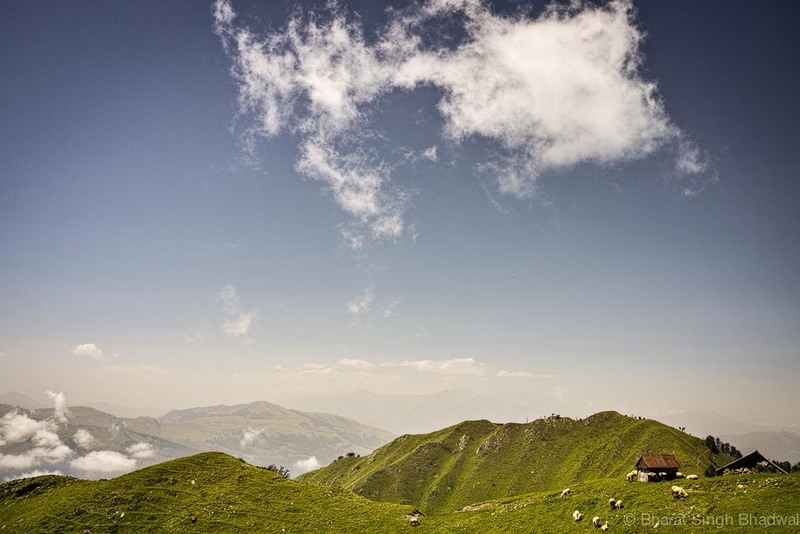 The route hugs the Shivgarh ridge between an altitude of 2500 to 2700 metres. In the 1980s it is estimated that there were as many as 80 million white-rumped vultures in India. However, between 1993 and 2003 their population declined by 99.7%. The reason for this decline was discovered in 2003 by Dr. Lindsay Oaks and his team to be diclofenac. Diclofenac is a common anti-inflammatory drug administered to livestock. The drug is fatal to vultures, and a vulture is exposed to a mortal dose of diclofenac if it eats from the carcass of an animal that has been treated during its lifetime. It is believed that the Himalayan Vulture is less affected by this crisis, because it is exclusively mountain-dwelling. 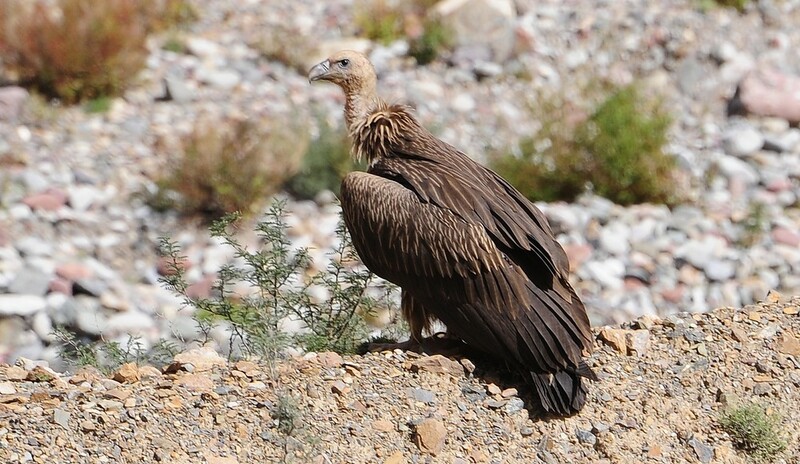 No recent study has been conducted on how diclofenac has affected the Himalayan vulture population. So take a moment to savour the flight of these giants. When you stare at their colossal girth, it seems almost impossible that these massive birds can soar let alone fly. However, they do soar over the ridge in an absolute majestic aplomb. The best time to see these birds is late morning or early afternoon after the sun has warmed up the air with enough thermals to support their soaring. 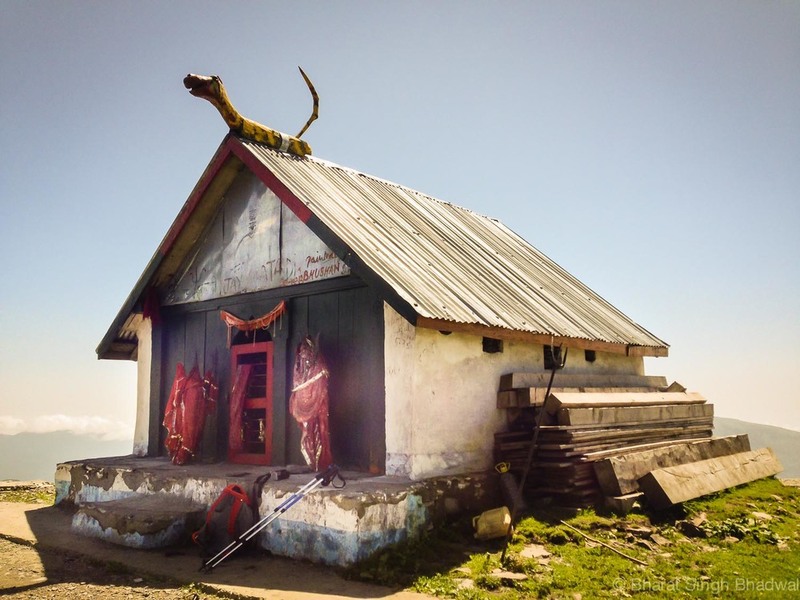 The star attraction of our trek route is the Chamunda Mata temple. This small but attractive temple situated at a height of 2788 metres, commands a mesmerising view. This is also the highest point of our trek. Standing near the it's entrance you can see the Chenab river winding its way to Doda. In the South the ribbon of tarmac enveloped by green grass is the now disused airfield at Mantalai. Late afternoons and early evenings are the best times to savour these views. Do take the time to admire the wooden tiger on the roof as it stands crouched, guarding the entrance. Chamunda Mata temple with tiger perched on the roof. On a clear day peering north, you may see the Brammah massif peeking through the clouds in Kishtwar Himalaya of Jammu and Kashmir. 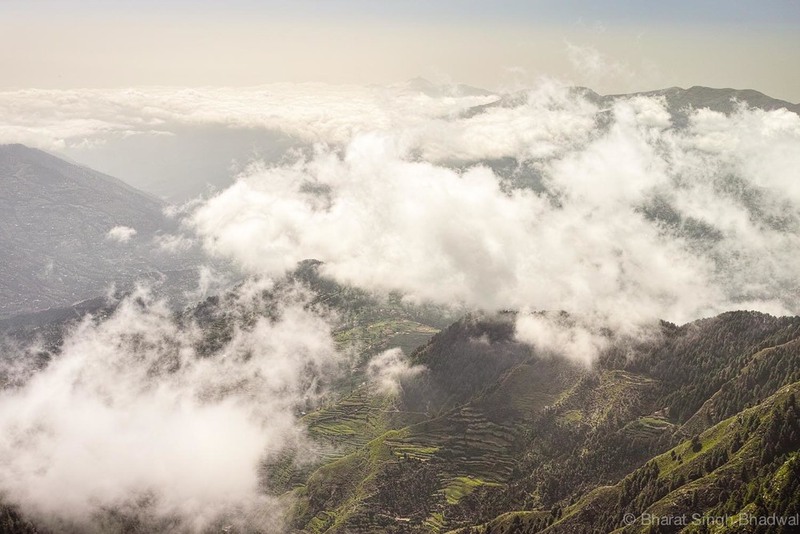 Brammah I is particularly notable both for its huge rise above local terrain and for it being the site of the first successful major climb in the Kishtwar Himalaya. Famed British mountaineer Chris Bonington, along with Nick Estcourt, and aided by the Indian Institute of Skiing and Mountaineering, made the first ascent of Brammah I in 1973 via the Southeast Ridge. 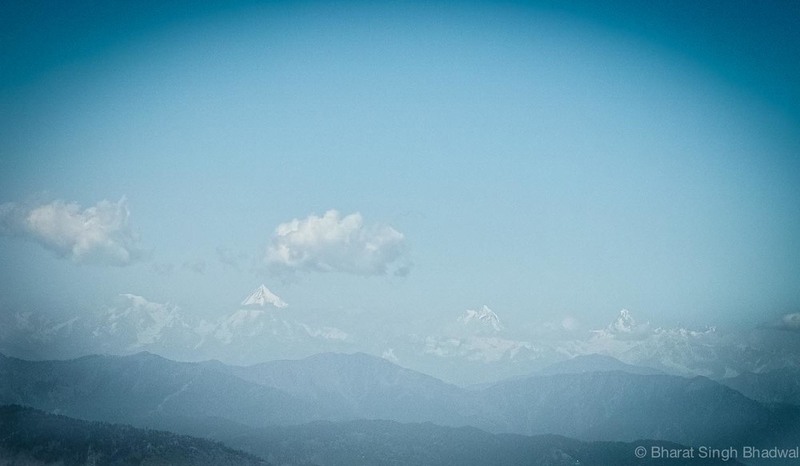 Estcourt notes that "it is not the highest peak in Kishtwar, but it is the most obvious and elegant." The trek ends at Sudh Mahadev temple. Believed to be 2800 years old, This temple is one the oldest Shiva temples in Jammu & Kashmir. In the premises, there stands a Trident (Trishul) that in the local dialect is called 'Gaja'. The sacred Trident has inscriptions in an ancient manuscript that are yet undeciphered. 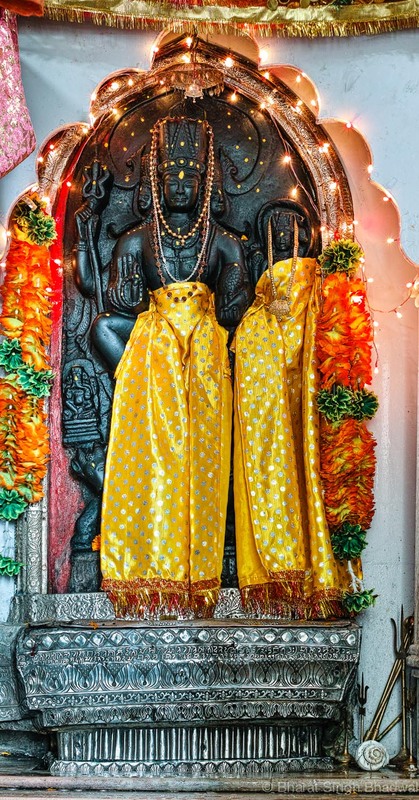 Although photography is prohibited in the temple premises, we were given a carte blanche to photograph for a few minutes resulting in this rare photograph of the temple. The trek starts at Hotel Green Top in Patnitop. Follow the water pipes through Patnitop woods as they ascend to a grassy knoll. From this knoll follow the rocky trail to your right. 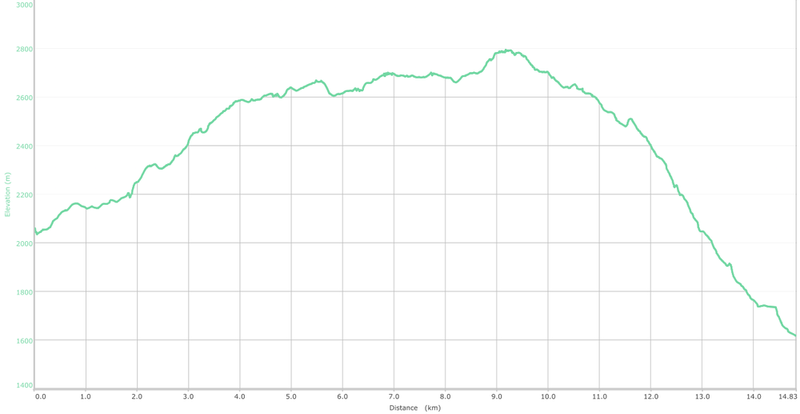 This trail stays below the unnamed ridge and it follows the ridge to a meadow. These rocky crags along the ridge are the best place to enjoy the soaring vultures. From the rocky crags the path follows the ridge line along a grassy meadow to a shallow rainwater pond. The temple dedicated to the deity, Chamunda Mata sits majestically over the knoll overlooking the pond. From the temple descend to the pond and rejoin the trail as it defends gently to a small cluster of houses. From these houses take the trail that descends rapidly through a fir forest at a nullah (mountain stream). Follow this nullah downstream. The stream joins the Chenani-Lati road near Sudh Mahadev town hospital. The temple is 200 meters on this road to your left. 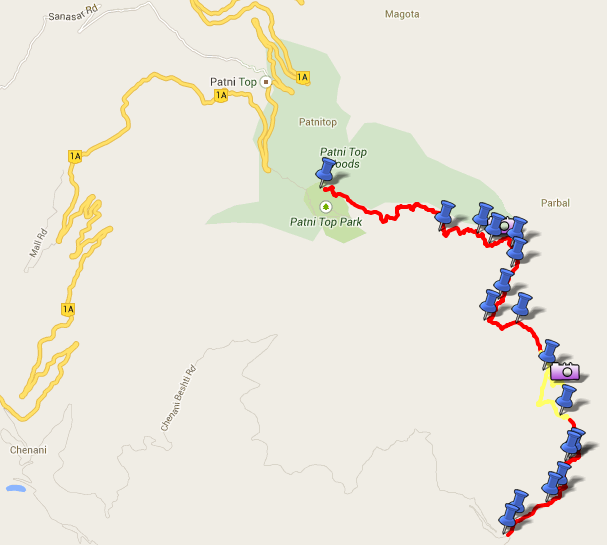 Start at Hotel Green Top, Patnitop and end at Sudh Mahadev on the Chenani - Lati road. Sudh Mahadev is 20 kilometres from Chenani town. Chenani is a major town on the NH1A connecting Jammu to Srinagar. Hotels for every budget are available at Patnitop. Budget hotels at Sudh Mahadev and basic and cheap accommodation available at Sudh Mahadev temple. Caution - The decent at the end is sharp and for a kilometre the route is covered with rotting fir needles. Be careful when negotiating this section as the needles may be slippery, especially when wet. You shall cross the mountain stream at three places near the end of this trek. Although the stream is not deep, a slip could be potentially dangerous. Do not take off your shoes for water crossings, wet shoes are far less painful than a twisted ankle or a pricked foot.